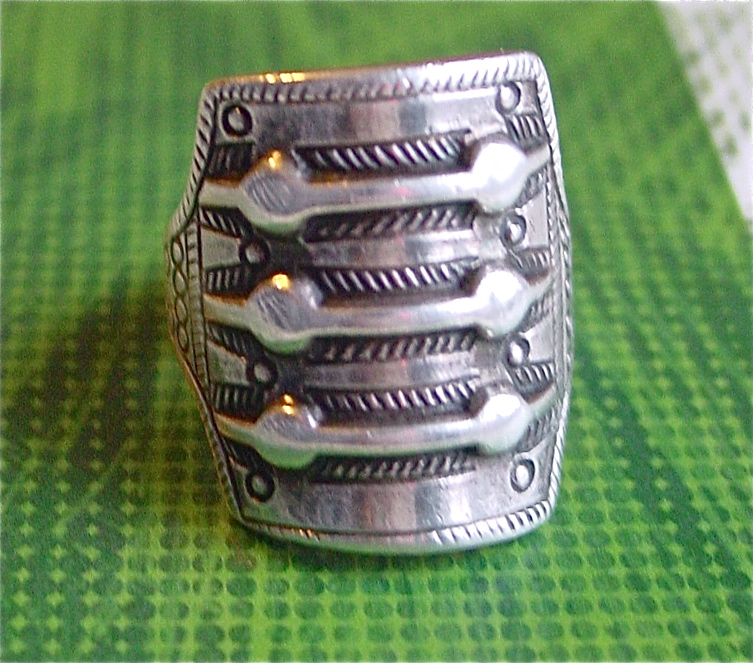 This ring, by Norwegian silversmiths David-Andersen, is a 1960s or 70s copy of an authentic Viking design. Part of the Saga series, the company copied jewels made around 300 A.D. and found in burial mounds. I found an 1983 article in the New York Times which put the price of this piece at about $50. I can’t tell you the value. I just usually check on eBay myself. Thasts ok, thank you very much for your information ! The saga jewellery has been out of production for a very long time. Your best bet would to search on Ebay or Etsy. There are also several online dealers who specialize in mid century modern and Scandinavian jewellery. You could contact them to let you know if they come across this ring. Good luck. I hope you get your jewels back. If anybody has any leads or advice for Lindsey, please share! Thank you so much. This is the first message I opened on my new computer I just had to replace after the robbery! Really made my evening. I’ll let you know when I get it. Not the same but will help the heartache a little. I’ve been wearing this ring and only this ring every day since 1967. My mother brought it back from Norway and loaned it to me. She eventually gave it to me and years later found another on a cruise. The silver on mine is all worn down around the edges and I recently hooked it on a ladder I was moving. It needs repair now badly. I feel naked without it. Please help me find this ring . These rings seem to come up semi regularly on eBay and Etsy. Good luck in your search! The ring is adjustable, but we need to know your ring size. Hi John, it will be great to have a new ring even if it is not the original you knew. It’s the weekend and I found the response to be slow even during business days so I hope she gets back to you this week. Sounds like you emailed on Friday when the office was probably closed. The company is the right company. Good luck! What does the Viking Midweek Modness ring symbolize? I want to give it to my son, the ring my father wore. Hi there. It doesn’t symbolize anything. It is a copy of a ring found in an ancient Viking archaeological site. I have this ring which my Mum brought back to Kenya from Norway in 1995, the adjustable bit caught on something so i had to take it to a jeweler for repair. They decided to do me a “favour “and polish it as well. I am livid it’s all shiny and gaudy now like a cheap Indian ring. How can i get it back to it’s original patina? Apparently you can get the patina back with a bit of sulfer. Google silver and eggs and you’ll find some advice. I whant to buy this ring but I can not find. Maybe someone can inform me or knows why I can buy.? Than you make me very happy.